Foreshadow, a musical group that blends the core genres of death metal, black metal, old school thrash metal, to create their own, unique sound, has begun to deliver a plethora of lyrical and melodic genius to the world. Reigning from their infamous hometown of Tampa, Florida, Foreshadow uses their vocal and instrumental influences to comment heavily upon the lies that have enveloped as truth amongst the general population. Influenced by such artists who include Slayer, Lamb of God, Nile, and Pantera, Foreshadow has completed their second release, a studio EP, “The Stranger End of Death”. The album will be released to fans and fellow listeners independently, and will deliver the group’s ideas and collective beliefs that are saturated in a sense of self empowerment and individuality. Recorded, mixed, and mastered at Spyder Studios in Cleveland, OH, with producer Tony Gamalo. Foreshadows second release pays homage to Ozzy Osbourne, Metallica, and the bassist for Primus Les Claypool; all of whom have served as inspiration for various members of the band. Band members, Daniel “Corkscrew” McConaghy (vocalist), Aaron Robinson (guitarist), Jon McDonald (drummer), and Chris Billingsly (bassist), have been united under Foreshadow umbrella since January of 2008. Individually and collectively, alike, the band is extremely familiar to stage performance. 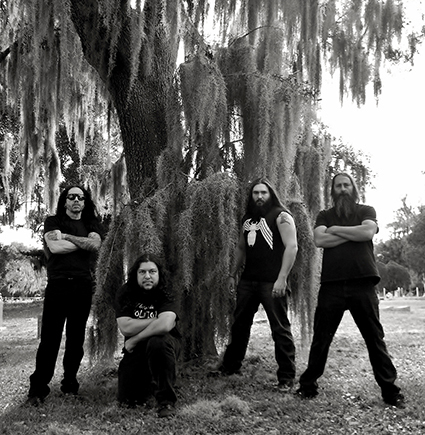 During the album cycle for their current release “The Stranger End of Death,” Foreshadow has headlined the “Southern Steel Tour They have also opened for international metal bands Dying Fetus, TYR, Scattered Hamlet, Mushroomhead, Hed P.E., Psychostick, Lord Dying, and Howl, as well as performing Fall Fest in Miami, Florida, the 11th Annual Deland Music Festival, and also has headlined Kaos Fest III (Princeton, IN), Calarca Metal Festival (Calarca, Colombia),Sound of Thunder Fest (Tulua, Colombia), and A2 Fest 2013 (Ann Arbor, MI.) Foreshadow has also released their music video in April 2012 for their first single, “The Meaning of Life”. The success of Foreshadow presently and in the future of the mainstream industry, stems from their ability to avoid the pressures and standards of metal music to dictate their visions and creativity. Ultimately, the group wishes to inform, motivate, and enlighten the mind set of their fans and listeners.